Sound tuning right from your phone! 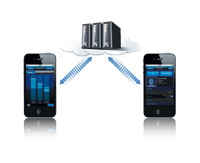 Download the Alpine TuneIt App with TTS and connect your iPhone via USB or your Android-based phone via Bluetooth®. 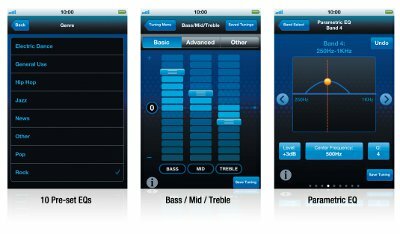 Your phone instantly becomes a sound tuning interface. As you change settings on the phone, you hear the results, so you can customise the sound exactly how you want. Sound tuning choices include 6-channel Digital Time Correction, 9-Band Parametric EQ, Center Frequency, and Crossover cut-off, level and slope. With version 1.20 and higher you can automatically share on Facebook that you uploaded a new tuning setup to your car radio. Share your settings with other users! After making your sound settings, upload them to the Alpine Cloud Server to share them with other Alpine fans. You can also check out their settings, and rate them. 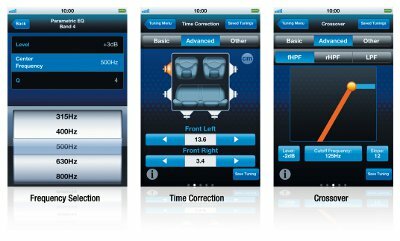 Download some high rated or interesting settings and try them in your car. The database will keep growing, so check back often to see new ones. The Alpine TuneIt App with TTS also keeps you in touch with your Facebook friends. When you receive a new message, you get a visual notification on both smartphone and head unit, plus a sound notification through your car’s speakers. The visual notification includes a big “f” logo and the sender’s name, with the profile picture shown on the phone. With Alpine TuneIt App with TTS you can even listen to your Facebook notifications right from the head units with advanced Text-To-Speech technology. Notification List allows you to scroll through the last resent messages and notifications right from your Head Unit.